Effective communication isn’t about winning. It’s about sharing your ideas persuasively in the classroom, in teams, and ultimately in the boardroom. Here, you are coached in your communication effectiveness, your skills honed to the place where you can communicate effectively in any circumstance or situation. Present, share, listen, and ultimately engage your team for success. The strength of a leader is in knowing your weaknesses. Through hundreds of cases, you’ll learn how to approach difficult problems with confidence, work effectively with people of diverse perspectives and skills, and solve problems by effectively engaging your team. You’ll move from the ability of one to the power of the many. A one-year MBA Program means you have to be skilled in making the right choices amidst cases, projects, case competitions, and, yes, fun. Great leaders must be able to focus their organizations on what matters now in the midst of competing choices. 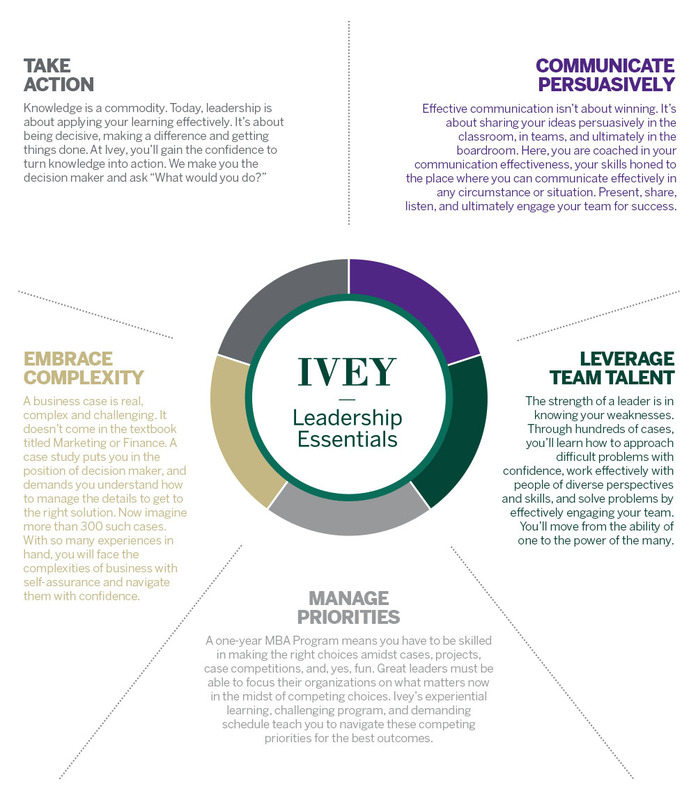 Ivey’s experiential learning, challenging program, and demanding schedule teach you to navigate these competing priorities for the best outcomes. A business case is real, complex and challenging. It doesn’t come in the textbook titled Marketing or Finance. A case study puts you in the position of decision maker, and demands you understand how to manage the details to get to the right solution. Now imagine more than 300 such cases. With so many experiences in hand, you will face the complexities of business with self-assurance and navigate them with confidence.